Tricia Taylor is a former teacher and lead practitioner in schools in London, UK and Brooklyn. With 20 years of experience in both primary and secondary schools, Tricia founded TailoredPractice and now partners with schools to use mind, brain and education research to both improve teaching and learning and create a climate and culture around perseverance and challenge. Tricia is also an Associate Lecturer for English at Goldsmith’s University teacher training program in London and Education Consultant for PowerTools, based in New York City. In this article, Tricia writes about Dunraven School in London, where she worked for many years as Lead Practitioner. Tricia tweets at @TriciaTailored and blogs occasionally at www.tailoredpractice.com/blog. More about Tricia and TailoredPractice can be found at tailoredpractice.com. If you are reading the Learning Scientist blog, then most likely you know about the mounds of research behind the effectiveness of retrieval practice (RP) and spaced practice. In the UK, there is a surge of interest in strategies that can help students remember more information. The new curriculum is content-heavy; exams are linear (i.e., cumulative). Students should be using the most efficient strategies available from cognitive science. “Why waste your time not doing that?” I ask. But these methods take some convincing at first, because RP and spaced practice feel like extra hard work. Re-reading your notes is easier than creating flashcards. Cramming takes less planning than spacing. What if the students were learning these habits at a younger age? What if these techniques were just ‘how we do things’—instead of the much less effective, yet popular, methods of re-reading text or copying notes (1). Waiting until secondary school to teach children how to improve their memories contributes to widening the knowledge gap between the haves and have nots. In Daniel Willingham’s Why Children Don’t Like School, he advocates starting early. “People who have more in their long term memory learn more easily, the gap is only going to get wider” (2, p.45). Having knowledge in turn improves thinking skills. Again, the rich get richer. By the time students reach secondary school, the children who started out behind in primary school will be even further behind. At Dunraven School, an all through (K-12) school in London, a Year 3 (2nd grade) teacher and I decided to target his class to see if we could get students using RP to learn. Unfortunately, not as much has been written about implementing RP with primary school children, but according to the literature there is much promise (3). Ritchie, Sala and Mcintosh’s retrieval practice experiments with students 8—12 years concluded that “Primary school teachers, like other educators, would benefit their pupils by using retrieval practice in the classroom” (4). Megan Sumeracki, the co-founder of this blog, also has a relevant study (5) that we didn’t discover until after we had made attempts to implement this in our classrooms (see below). I was apprehensive to promote a “drill and kill” approach that creates an environment whereby memory is another way of comparing students. We didn’t want to stress out 8 year olds over memorising facts and we didn’t want them to feel bad about their memories. Dunraven Primary has spent the last several years building up a culture that values the whole learning process. Kids really get that challenge, hard work and feedback are part of learning. We needed to scaffold the recall even more than we thought—although we followed it up with a short quiz and gave prompts. Reflection is a crucial step. Remind children that it’s OK to forget and sometimes it takes a moment to remember something. That’s a normal way of learning. Students must experience initial success when asked to retrieve the information (5). Over the next several weeks, our aim was to scaffold RP and build in more opportunities for success. For example, we gave students handouts with text on the left side and fill-in-the blanks on the right. We tested which they remembered better. Not surprisingly, the fill-in-blank information was easier to recall, though this difference was not significant. As we carried on observing, however, our research focus started to shift. We started looking more at how we model RP rather than which is the best RP strategy. I recognize that some students have better working memories, but I also know that everyone in our class could improve their recall and that the latter point was important to share with students. Self-efficacy is a key factor in determining the success of a student in the classroom (6). We shared with the students a useful quote from one of the Exit Tickets: “To remember, I just needed to think more about it . . .” and I adapted a familiar mantra: “If you don’t remember something now, you can say ‘I don’t remember yet.’” But we still needed them to experience it. For the next round, the students were instructed to pick just 3 of the questions to quiz their partner. We watched. A close observation of how students were quizzing each other revealed some insights I’d like to highlight. If your partner doesn’t know the answer, you offer a hint like the first letter of the word. When they answer, ask your partner to put it into a full sentence to make sure they understand it. Be supportive (it’s OK to forget!) and give them time. 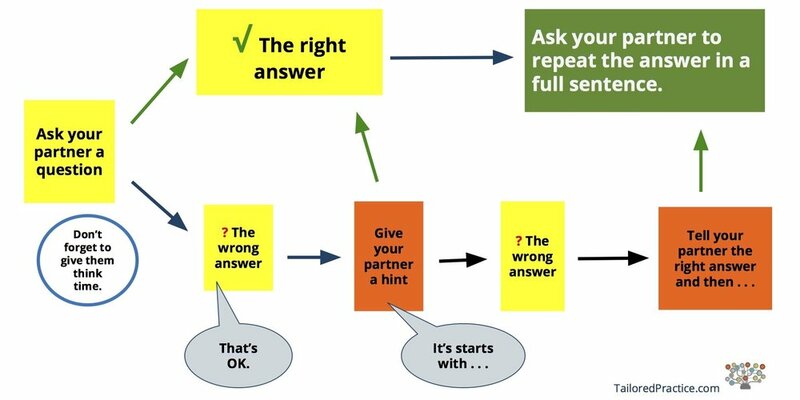 If the answer is still wrong, tell your partner the right answer, but ask them again at the end. We need to explicitly model RP with a very straight-forward, easy-to-follow procedure for how to quiz each other. The teacher and I modeled how to practice RP with a friend (see diagram). Some of the questions we got right; some we got right after a hint (or mnemonic) and some we got wrong (who knew there was a male part of a flower?). Each scenario was modelled with the diagram in front of the students, clicking through each step. They were excited to begin. They worked in pairs to have a go. There were 3 neutral faces. One comment: “Hard but good for my brain” and two sad faces: “I felt sad because at the start I didn't quite get it and I did not like that.” and “I felt rushed because bumble bee (partner) was going too fast”. (Compared to the first round: 5 smiles, 13 neural and 7 sad faces). I met up with the class and their teacher two months later in September to find out what they remembered about memory—and plants. One student poetically explained, “Remembering is like when you’ve lost something in the back of your wardrobe (closet) and you have to keep looking for it until you find it” (though in reality, because memory is reconstructive, it doesn’t quite work that way). The class could recount all of the steps of quizzing (diagram above) with impressive detail. “You wait a while and then give your partner a hint,” “You have to ask the same question again later.” When we quizzed them on plants, there was palpable excitement as the majority of students knew the answers. (We first asked them to free recall with their partners to prime them for the quiz). When a student didn’t remember, it was OK. One girl was eager to share with the class that she spelled “stamen”, “salmon.” Her friend helped her and then the girl slowly and proudly spelled it correctly for everyone. Scaffold retrieval practice, meaning give prompts or hints to help. Create situations whereby students experience initial success. Spend time on reflection so students understand it’s OK to forget and that remembering takes time. Explicitly model how to practice RP. Lastly, do not compare students. Each student has their own learning trajectory. (1) Dunlosky, J., Rawson, K. A., Marsh, E. J., Nathan, M. J., & Willingham, D. T. (2013). Improving students’ learning with effective learning techniques: Promising directions from cognitive and educational psychology. Psychological Science in the Public Interest, 14, 4-58. (2) Willingham, D. T. (2009). Why don't students like school? : A cognitive scientist answers questions about how the mind works and what it means for the classroom. John Wiley & Sons. (3) Karpicke, J. D., Blunt, J. R. & Smith, M. A. (2016). Retrieval-based learning: Positive Effects of Retrieval Practice in Elementary School Children. Frontiers in Psychology, 7. (4) Ritchie SJ, Della Sala S, McIntosh RD (2013) Retrieval practice, with or without mind mapping, boosts fact learning in primary school children. PLoS ONE 8(11): e78976. (5) Karpicke, J. D., Blunt, J. R., Smith, M. A., & Karpicke, S. S. (2014). Retrieval-based learning: The need for guided retrieval in elementary school children. Journal of Applied Research in Memory and Cognition, 3, 198-206. (6) Hattie, J. (2012). Visible learning for teachers: Maximizing impact on learning. Routledge.